Images of One Center Plaza, by Welton Beckett and Associates, 1966-69. Digital Imaging Project: Art historical images of European and North American architecture and sculpture from classical Greek to Post-modern. Scanned from slides taken on site by Mary Ann Sullivan, Bluffton College. The Government Center plan, developed by I. M. Pei, includes federal, state, and city offices as well as private office and retail space. This redevelopment plan preserved older buildings as well as the Sears Crescent. 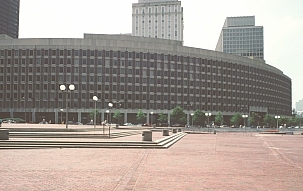 The center of the new development is the large brick City Hall Plaza with the new City Hall as the focus. One Center Plaza repeats the curve of the Sears Crescent and provides a backdrop for City Hall Plaza. This building contains a shopping arcade. 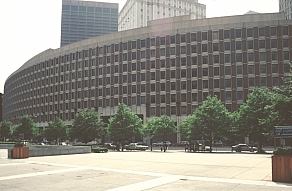 Other modern buildings in the Government Center on this site include John F. Kennedy Federal Office Building by The Architects Collaborative (TAC), Rudolph's State Health, Education and Welfare Services Center and Boston City Hall by Kallman McKinnell and Knowles.